‘Together, they swoop and tumble in a dazzling courtship dance.’ As the story progresses, Celia seamlessly introduces the concepts of conservation in response to the long term effects of global usage of DDT. Celia describes how the first clutch of eggs was taken from the birds to be raised in a bird sanctuary. Without bogging down the story, Celia provides justification and explanations of actions taken. In regards to the removal of the eggs Celia notes that ‘The falcon rescue teams know that peregrines often lay a second clutch if the first is destroyed.’ The pair of falcons do indeed lay more eggs and raise one chick that year. The book follows the development of the human raised chicks. Celia explains that due to the usage of DDT the peregrine falcon ‘…had disappeared from great tracts of its former territory’ and shows that even high rise buildings in cities have been used successfully to reintroduce the peregrine falcon. “…The fastest bird in the world? I had no idea. It upped the ante to find our more about them. 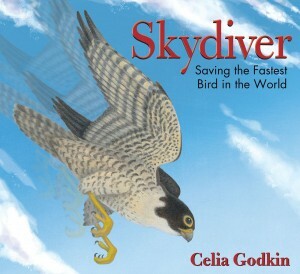 Find out more I did…The informative text and detailed accompanying artwork show young readers the birds in their airy habitat, on the edge of a rock ledge. After hunting for needed food, the male is on his way back to the nest when he spots people nearby. One of those people climbs down to the nest, carefully removes the eggs and climbs back to the top of the cliff…The author assures that her readers understand the danger that these beautiful birds have faced, and how their numbers are improving because of the care and concern shown by leading scientists.